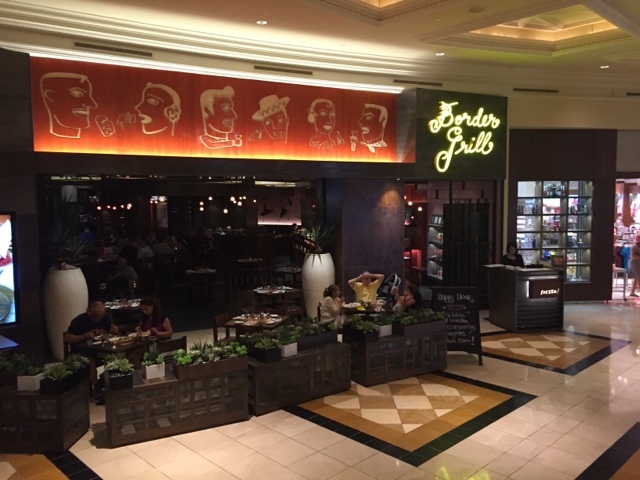 Chefs Mary Sue Milliken and Susan Feniger are the creators of the Border Grill restaurant. The first restaurant was located on Melrose Avenue and in 1990, moved to its current home on 4th Street in Santa Monica. 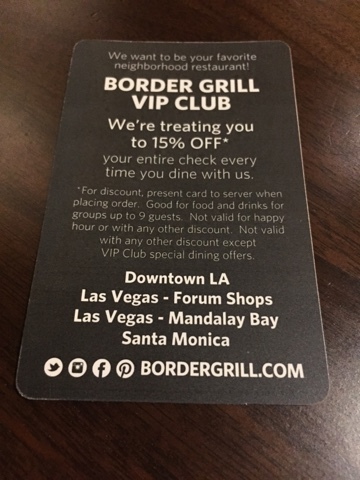 Since then, Border Grill has expanded to Las Vegas at Mandalay Bay Resort and Casino (1999) and The Forum Shops at Caesars (2014). 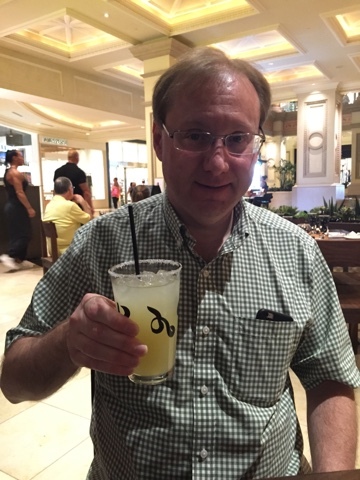 We were staying at the Nobu Hotel in Caesar’s Palace, and decided to have a late 9:00 pm dinner at the Forum Shops location. It wasn’t easy to find, as its not located in the heart of the Forum Shops, but closer to the Strip, on the ground floor where the spiral escalators are located. 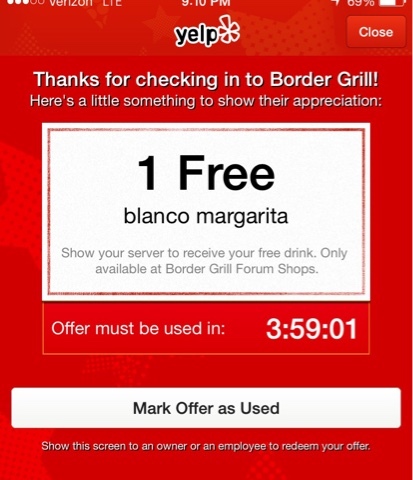 If you use the Yelp app, you can get a free Blanca Margarita, an $11 value, just for checking in. In addition, if you sign up for the VIP club, you can get complimentary appetizers, dessert and 15% off the check. 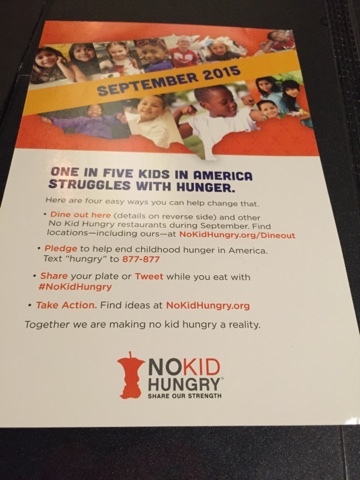 Also, Border Grill is a supporter of #NoKidHungry, and for the entire month of September they are donating $1 from every Roasted Tomato and Bacon Guacamole purchased at Border Grill and Border Grill Trucks. 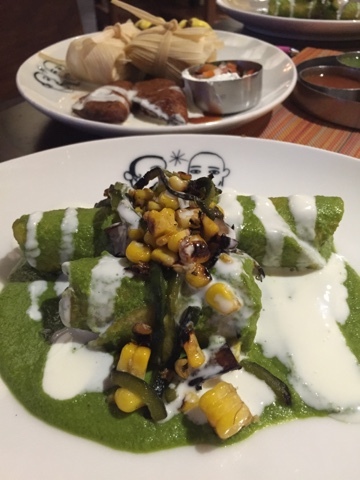 Even though it was 9:00, we were still not very hungry and decided to share the Border Classic appetizer and the chicken poblano enchilada plate. 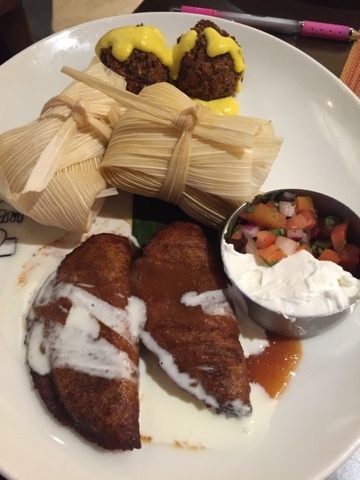 The appetizer plate had 2 green corn tamales, 2 quinoa fritters and 2 plantain empanadas. 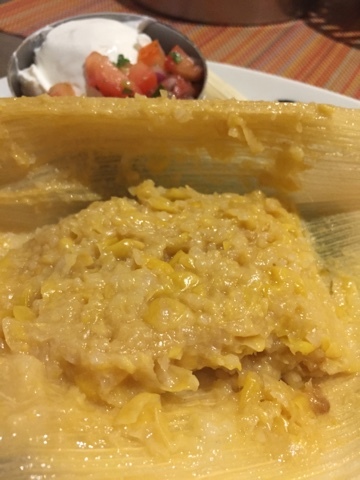 The enchilada plate came with 3 per order, but the restaurant was kind enough to split the entree for us. Very thoughtful. 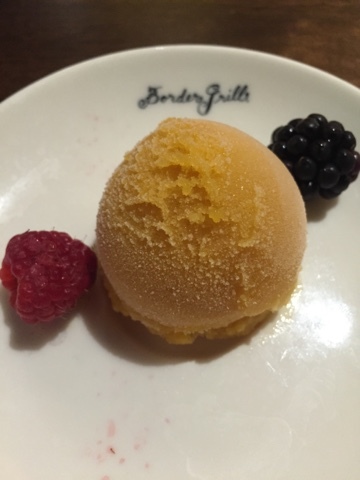 The dinner was exactly what we needed, and, since we were VIP, we were given a small sorbet for dessert, which cleansed our palate and was a perfect ending to a great meal. 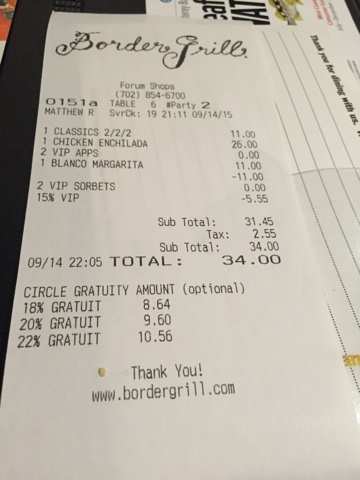 After all the applied discounts, our bill came to $31 before tax and tip…. truly a great bargain on the Las Vegas strip!